Also includes visit to elephant park. 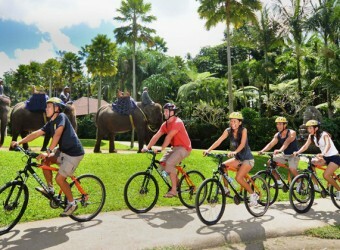 Activity Bali Adventure Tours cycling starts from Kintamani downhill trail to Ubud. 26 KM-long mountain cycling starts from Kintamani to Elephant Park in Taro village through spectacular views, on the way of trip you can view temples, Balinese villages including Bali Aga village, rice terrace, fruit plantations and other stunning sceneries. Hotel Pick up Service, Mineral Water, Equipment, 26Km-Long Cycling Including a Professional Cycling Guide, Support Vehicle, Chilled Face Towel, Enter Safari Park (including hand feed elephants and watch elephant show), Buffet Lunch and Insurance Cover. Sport Shoes, Comfortable Clothes, Hat or Cap, Sunscreen etc. ・You can enjoy spectacular view of Lake Batur and amazing Mount Batur. ・Choose your favorite bicycle and some instructions from guide. ・Keep your goods at pick up car or support vehicle. ・You will get information about daily life of Bali Aga village from our guide. ・You’ll get information about Balinese daily life and Balinese traditional house from our guide. ・Pass through the stunning view of rice terrace and wood carving centre. ・Hand feed the elephants, taking pictures with elephants, visiting museum and other activities. 9：30～10：00 Start point. Choose a bicycle, prepare and safety lecture. 10：00～12：00 Visit traditional Balinese village, farms and rice terraces. 12：00～12：30 Arrive at elephant park. ※The schedules might be back and forth due to the traffic. 15：00～15：30 Start point. Choose a bicycle, prepare and safety lecture. 15：30～17：30 Visit traditional Balinese village, farms and rice terraces. 17：30 Arrive at elephant park. ※Minimum booking of 2 people. ※Contents are subject to change without prior notice. ※The insurance cannot cover damage or loss to your belongings. This activity is operated by the service company, and we make reservation of this activity. The scenery of Bali countryside is very beautiful!! Little children greeted me in a loud voice” HELLO”!!! I left my clothes and a big luggage in the pickup car and enjoyed cycling.